Here is the wonderful sound of Mamet picking up the tune of his own best work. From American Buffalo to Glengarry Glen Ross to Speed-the-Plow, he has depicted not just the evil things that men do to one another—the con jobs, the betrayals—but the moral and ethical codes that bind them. He is the poet laureate of honor among thieves. A play dissecting the web of loyalties that entraps an elected official and his wealthy enabler is a play that I’d love to see, from Mamet more than from any writer alive. Instead we get a satirical line of attack familiar to every bantamweight political cartoonist in America. The president is venal, corrupt, and feckless. Government is a shakedown. 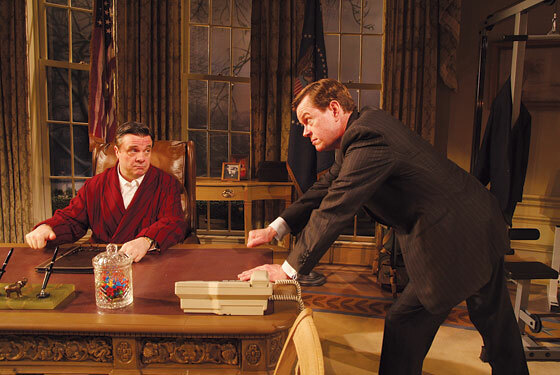 Mamet being Mamet, the result is occasionally funny—as when the president (Nathan Lane, in fine collar-straining form) seeks money through a baroque extortion racket involving the annual turkey pardon. “I want a number so high even dogs can’t hear it,” he tells an industry representative. Dylan Baker gives a droll turn as the lawyer who maintains a tenuous link to the reality-based world, and Laurie Metcalf impressively survives the role of lesbian speechwriter. Orchestrated by Joe Mantello, they collide in the most profane conversations heard in the White House since Nixon cursed alone. Yet the Oval Office scenery only underscores what’s wrong: On the subject of presidential politics, the play rings false. The plot hinges on a chief executive dependent on one speech from one speechwriter. Many of its complications rely on his being mysteriously isolated from the swarm of handlers that surrounds presidents. I don’t mean to be overliteral—I only want to figure out why a satire so pleased with its toughness felt to me like a Beltway fairy tale. In fact, this doesn’t seem like a play about politics at all. Remove the White House trappings, change a few job titles, and the story becomes vastly more plausible in the world of the movies. A woebegone film director—hamstrung by his studio, reliant on a skittish screenwriter—cuts one desperate deal after another to finish the job. As a Mamet fan, I’d hoped this play might match the brilliant satire of Wag the Dog. It’s more like a remake of State and Main. If the weather has turned frigid and hideous, it can only mean it’s time for our annual midwinter mind-blowing from Richard Foreman. Deep Trance Behavior in Potatoland finds the maestro in a meditative mood. The dark costumes, twin pianos at center stage, and silvery old photographs lining the walls conjure a more sedate world than his last few pieces. Thunderous music booms, lights flash in our eyes, and plenty of freakiness of course intrudes (like the six-foot-tall avian creature wearing a king hummingbird sash and American flags). But the most affecting moments here are the pockets of stillness, which give this gnomic play a downward-tugging sadness. It helps that Foreman has made his most assured use yet of film onstage. Two screens on the back wall of the Ontological-Hysteric project video filmed in Japan and England. The composition of the group shots—young English girls, Japanese men and women of all ages—has a coherence and focus that his earlier videos didn’t. The portraits, in particular, have a steady, evocative power, especially one that shows a Japanese woman ritualistically rubbing her hands. If Foreman abides by his decision to forgo video next year, returning to the text-and-actor-driven work that makes him a legend, I’ll be glad that his mixed-media adventure ended on a virtuosic note. Though I’d be happier still if he made a video for Radiohead. Shaw and director Warner handle Samuel Beckett’s bleak play much as they treated Medea a few years back: warming it up, making it accessible. Even though she’s buried up to her waist in a mound of dirt, Winnie is vivacious, chatty, self-regarding—the lady who fails to notice that nobody else at brunch has gotten a word in. That approach made Euripides’s story of a woman who kills her children so devastating that even now I can see the murder scene. It also makes Happy Days a pleasure—while the play lasts, anyway. For I find that it hasn’t stuck with me, not the way that Mikhail Baryshnikov’s brief turn in Beckett Shorts in December has. By going to great lengths to bring out Winnie’s individuality—the quirks of personality that make her a particular woman, not Woman—Warner loses some of the resonance of Beckett’s cosmic despair. Of course, her approach may turn out to be hugely forceful somewhere down the line. Warner has plunked Winnie down not in a dirt mound of totemic significance, but a true-to-life landscape of shattered concrete and rock. Maybe we’ll herald her foresight, should we ever find ourselves, like her Winnie, isolated, sun-ravaged, and up to our necks in shite. By David Mamet. Ethel Barrymore Theater. By Richard Foreman. The Ontological-Hysteric Theater. Through April 13. By Samuel Beckett. BAM. Through February 8.